Popularly known to many countries as a “miracle plant”, Moringa Oleifera earned its reputation because of the wide range of nutritional and medicinal properties which can be acquired from almost any part of the tree. As one of the most cultivated species of its kind, it belongs to the genus Moringa – the sole genus in the Moringaceae family. It grows primarily in places which have tropical, subtropical and semi-arid climate. The Moringa tree is indigenous to north-western India, particularly in the southern foothills of the Himalayas. It is currently cultivated extensively in Central/South America, Africa, Indonesia, Mexico, Malaysia, Philippines and India. The Moringa tree goes by different names in different countries. In the Philippines, it is known as malunggay, and referred to as Muringa in India (Malayalam), Sajina in Bangladesh, and La Mu in China. Moringa benefits are quite plentiful, and these are clearly evident in its exceptional nutritional value and remarkable medicinal properties. This miracle plant is overflowing with vitamins such as Vitamins A, B, C, D and E, and minerals which include potassium, calcium, iron, selenium and magnesium. The Moringa leaf alone is a treasure chest of potent and disease-preventing nutrients, as well as essential amino acids – something which is not very common for a plant source. When compared to other food sources, Moringa leaves are more potent in nutritional value. Its Vitamin C content is seven times more than that of oranges, has thirteen times more vitamin A than spinach, and is on a league of its own when it comes to amino acids – 2,500 times more than green tea and 242 times more than apple. It is also a good source of good cholesterol – high density lipoprotein, which, in high levels, is known to protect against cardiovascular diseases. Breastfeeding mothers can also greatly benefit from fresh Moringa leaves as they are known to increase the volume of milk. 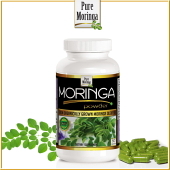 Moringa leaves are completely safe for consumption – they have no known negative side-effects, nor toxic elements. 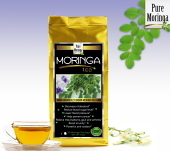 The leaves are most often used to make Moringa tea. Since the tree’s leaves are packed with exceptional nutritional value, they are infused into one of the world’s most highly-prized herbal tea. Moringa tea contains a combination of potent variety of antioxidants, such as Flavonoids, which help in inhibiting the effects of free radicals. This herbal tea has a wide variety of medicinal applications – it can be used to help stabilize blood pressure, manage glucose levels in people with diabetes, and help promote better sleep. It is also an excellent energy booster, the natural way, and unlike energy drinks, coffee or other tea, it does not contain caffeine or other stimulants which may cause health problems. The seeds of the tree can be used to produce what is known as Moringa oil. This special oil is at par with the likes of olive oil and sunflower oil, and is well-known for its remarkable oxidative stability. Unlike other types of oil, this one will not go rancid, making it perfect for use with making salads and other cooking purposes. With its light texture, Such oil is also best used for body massage and aromatherapy procedures. Its high concentration of Oleic, Linoleic and Palmitoleic acids give this oil its nourishing and moisturizing properties. It is also a good natural antiseptic, which is very useful in alleviating and soothing discomfort from insect bites, rashes, and minor burns, bruises and scratches. Extensive research and development procedures are being done with the Moringa tree – its roots, bark, leaves, seeds and all other parts, in order to unlock other medicinal and beneficial properties this miracle tree may have.